Pharmaceutical Sciences Research Center, Shiraz University of Medical Sciences, P.O. Box 71345-1583, Shiraz, IRAN. Department of Pharmaceutical Biotechnology, School of Pharmacy, Shiraz University of Medical Sciences, P.O. Box 71468-64685, Shiraz, IRAN. Chlamydomonas reinhardtii, the most commonly studied model organism in microalgal kingdom, is known to be a rich lipid producer. Here, a naturally isolated C. reinhardtii strain was cultivated phototrophically at Erlenmeyer scale in BG11 culture medium. After reaching to stationary growth phase, a nitrogen limited regime with different nitrogen concentrations was applied. Quantitative real time PCR analysis of DGTT1 and DGTT2 genes involved in triacylglycerol accumulation confirmed an increased level of expression for DGTT1 (21.05-fold increase) in nitrogen starvation compared with the nitrogen rich conditions. Besides, DGTT2 transcript levels showed a slight decrease in nitrogen deprivation condition (0.61-fold). The results opened a new way to direct microalgal systems biotechnology towards maximization of triacylglycerol production for green energy production. Changes in environmental conditions such as temperature, light intensity and number of minerals in the medium, such as adding iron or urea nitrogen or phosphorus to culture medium or lowering its amounts makes up the bulk of microalgae lipid content in the form of triacylglycerol (TAG) stores.4 TAG is obtained from a combination of three fatty acids esterified with glycerol. All eukaryotic organisms can synthesize TAGs, and the main constitute of the lipid contents in vegetable oils and animal fats is considered to be TAG.5 Nevertheless, the details of the molecular mechanisms involved in TAG accumulation phenomenon is still in its infancy. Although, the eukaryotic microalga Chlamydomonas reinhardtii has not been regarded as a biodiesel producer in industrial scale, it has been considered as the preferred molecular model organisms over other species of microalgae.6 Besides, due to its available complete genome sequence7, it has been regarded as an attractive model to study many biological phenomena such as starch or lipid metabolism, energy carrier synthesis, photosynthesis, or cellular responses to nutrient starvation. C. reinhardtii is capable of phototrophic or heterotrophic metabolism and shows a high responsive capability against the environmental stressors in the form of metabolic changes. However, the details of TAG metabolism in C. reinhardtii, has been merely studied. On the other hand, the TAG production pathway is a vital part to optimize a robust process for microalgal biodiesel production. Some studies have been dealt with the mechanisms involved in TAG production during nutrient depletion in C. reinhardtii.10,11 Nevertheless, there is still a controversy in the results of previous studies and the exact role of each acyltransferase enzyme in TAG accumulation phenomena is still unveiled. Here we investigated the expression profile of DGTT1 and DGTT2 genes during nitrogen limitation in naturally isolated C. reinhardtii strain. Beside its growth kinetics, biomass and lipid production and productivity and TAG content of lipids in presence of different nitrogen levels were also examined. The molecular detailed of TAG accumulation phenomena might be useful to increase the biosynthesis of TAG, improve the lipid productivity and reduce the operating costs of microalgal biodiesel production. Besides, the results of this study could be used for C. reinhardtii systems biotechnology towards overproduction of TAG and other valuable bioactive compounds. The C. reinhardtii (Chlorophyta, Chlorophyceae) strain obtained from the Microalgal Culture Collection of Shiraz University of Medical Sciences (MCCS), Shiraz, Iran was cultivated in sterile BG11 culture medium composed of (per liter): NaNO3 (1.5 g); K2HPO4 (0.04 g); MgSO4.7H2O (0.075 g); CaCl2.2H2O (0.036 g); citric acid (0.006 g); ferric ammonium citrate (0.006 g); Na2EDTA (0.001 g); Na2CO3 (0.02 g) and the trace element solution (10 mL) (H3BO3 (2.86 mg L-1); MnCl2.4H2O (1.81 g L-1); ZnSO4.7H2O (0.222 g L-1); Na2MoO4.2H2O (0.39 g L-1); CuSO4.7H2O (0.079 g L-1); Co(NO3)2.6H2O (0.0494 g L-1)).12 After examining the uniformity and possible contamination in the obtained microalgal sample, the growth study of C. reinhardtii was observed for 21 days. The experiment performed in 500 mL Erlenmeyer flasks containing 200 mL of culture media. The flasks were incubated at 25 °C in an orbital incubator shaker (PECO, Iran). The cultivation conditions for 96h were set at the agitation rate of 130 rpm and the light intensity of 60 mol m−2 s−1 to obtain the final cell concentration of about 30×104 cell mL-1. After 10 days of cultivation, this primary seed culture was employed as a standard inoculum for further studies in shake flask experiment. Two modes of cultivation including normal and nitrogen starved conditions. In normal cultivation mode, the pre-cultured C. reinhardtii cells were transferred to three distinct 500 mL Erlenmeyers containing 200 mL of fresh BG11 medium. The cultivation procedure was continued for another 11 days under previously described conditions. In nitrogen starvation mode, C. reinhardtii cells from previous section was initially centrifuged at 3000×g, 20ºC for 5 min. The separated microalgal cells were washed using an isotonic normal saline solution (0.09 g NaCl L-1) twice to remove the possible cell debris. The obtained pellet was then resuspended in 200 mL of nitrogen starved medium (containing the BG11 medium without NaNO3). The starvation experiment was also exploited in triplicate and the mean values for the observed trends were reported. The microalgal cells were centrifuged at 3500 rpm, 4ºC for 5 min and then the total RNA content was isolated using a commercially available RNA extraction kit (catalog number: RN7713C) (RNXTM-PLUS buffer provided by SinaClon company, Tehran, Iran) according to the provided protocol by manufacturer. Briefly, 1 mL of the ice cold RNATM-PLUS solution and 1 mL of the microalgal supernatant were transferred to a poly propylene tube. It was vortexed for 10 sec and then incubated for 5 min at room temperature. 200 µL of chloroform was as added to the mixture and mixed for 15 sec. It was then incubated on ice for 5 min at 0 ºC. Next it was centrifuged at 12000 rpm at 4ºC for 15 min. The obtained aqueous phase was transferred to a new 1.5 mL RNase-free tube and an equal volume of isopropanol was added to it. It was gently mixed and incubated on ice for 15 min at 0 ºC. The mixture was centrifuged at 12000 rpm at 4 ºC for 15 min. The obtained supernatant was discarded and ethanol (75%, 1 mL) was added to the tube. It was vortexed for 10 sec to dislodge the pellet. It was then centrifuged at 7500 rpm and 4 ºC for 8 min. The supernatant was removed and the pellet was remained (5 min) till drying at room temperature. The resulted pellet was dissolved in DEPC treated water (50 µL). To improve the dissolving process, the test tube was placed in 55 ºC water bath for 10 min. The purified total RNA was quantified using spectrophotometrically (Pico Drop P200, Alfa Biotech, Glasgow, UK). The prepared RNA was then treated with DNase I (RNase-free) kit (E. C. 3.1.21.1, catalog number: AM2222) (Thermo Fischer Scientific, Massachusetts, USA) to reduce the possible genomic DNA contents. To synthesize the first strand cDNA sequence, RevertAid Reverse Transcriptase (200 U µL-1) (catalog number: EP0441) (Thermo Fischer Scientific, Massachusetts, USA) was employed with oligo dT primers in the final volume of 20 µL. AlleleID® software version 7.83 for windows, PREMIER Biosoft, Palo Alto, CA, USA was used for designing the target primers for 18S rRNA gene (FJ864686.1) from another C. reinhardtii strain13 as an internal control gene, DGTT1 (KC788199) and DGTT2 (KC788200) genes.9 The designed forward and reverse primers for three mentioned genes with their amplification length and other properties are presented in Table 1. Real-time PCR experiment was performed using MiniOpticon thermal cycler system (Bio-Rad Laboratories Inc., Hercules, CA, US) with Opticon Monitor™ analysis software control. The reaction was exploited in a total volume of 20 µL. In each tube, 1 µL of cDNA, 10 µL SYBR® Premix Ex Taq ™ II (TaKaRa, Japan) and 4 pmol of each designed primer was used. The employed real-time PCR cycle were optimized at 94°C for 2 min as initial denaturation step, followed by 40 cycles of amplification at 94°C for 10 sec, differing respect to the annealing temperature (Ta) for each employed primer for 15 and 30 secs of extension (72°C). Besides, two different negative controls including a reaction without reverse transcriptase enzyme and another without cDNA template were also examined. At the end of PCR reaction, the amplified products were used to analyze the dissociation curves. Moreover, it was confirmed that there is only a PCR product for each PCR reaction. Triplicate experiments were performed for each sample. To determine the relative fold of quantification, adopted DDCT method14 was employed. The observed differences at a level of 5% was regarded as significant. GraphPad prism version 6.00 (GraphPad Software, La Jolla California, USA) was employed for the statistical analysis. To determine the growth profile of the studied microalga, dry cell weight method was employed. 10 mL of each cultures medium was aseptically transferred to a test tube and centrifuged for 5 min at 10000 g and 4 °C. The obtained C. reinhardtii pellets were washed twice with an isotonic normal saline solution (0.09 g NaCl L-1). To remove the possible impurities, it was centrifuged again. The final microalgal pellets were dried at 95 °C overnight. The total lipid contents of C. reinhardtii was extracted using a previously adopted protocol with some modifications.15 Briefly, 1 g of biomass was boiled for 2 min in isopropanol followed by homogenization in chloroform-methanol (1:2) mixture with butylated hydroxytoluene (BHT) (0.05% w/v) as antioxidant. Then a mixture of water and chloroform (0.8 and 5 mL respectively), enriched by an aqueous solution of potassium chloride (0.88 w/v) was added. After vigorous shaking, the obtained solvent phase was collected and then dried under nitrogen gas. To investigate the total lipid content of C. reinhardtii, the gravimetric method was utilized. in which the dilution factor was regarded as 5. Growth rate of C. reinhardtii under different concentrations of nitrogen in shake flask scale during 28 days of study using dry cell weight method. [i] *Xmax = maximum biomass concentration (g L-1); μmax = maximum specific growth rate (d-1); Pmax = maximum biomass productivity (g L-1 d-1); Lmax = maximum lipid productivity (g L-1 d-1); N0 = cultivation at 0 g L-1 nitrogen; N1 = cultivation at 1.5 g L-1 nitrogen; N2 = cultivation at 1.0 g L-1 nitrogen; N3 = cultivation at 0.5 g L-1 nitrogen. Moreover, the influences of different nitrogen levels on lipid production and productivity was also examined Figure 2 a-d. As presented in Figure 2a, the accumulated lipids in the normal cultivation conditions (N1) was reached to 1.337 g L1. The maximum lipid productivity in this cultivation was reached up to 0.110 g L-1 d-1. On the other word, the total lipid content in N1 medium was 26.14% in the total produced biomass. At the end of cultivation process, the final obtained lipid production from three different nitrogen depleted media reached to 0.849 g L-1 (N2) Figure 2b, 0.635 g L-1 (N3) Figure 2c and 0.783 g L-1 (N0) Figure 2d. The reported values were equal to 28.05% (N2), 34.12% (N3) and 42.07% (N0). In this context, the observed lipid productivity values were noticed to be 0.021 g L-1 d-1, 0.075 g L-1 d-1, and 0.093 g L-1 d-1, at N0 (0 g L-1), N2 (1.0 g L-1) and N3 (0.5 g L-1), respectively. On the other words, nitrogen depletion, caused a noticeable decrease in the lipid productivity trends. The total lipid content of C. reinhardtii under different concentrations of nitrogen (a-d) (% w/w) in the final obtained biomass. DGTT1 and DGTT2 gene expression in a) different times, b) different concentrations. To investigate the effects of nitrogen starvation on the expression levels of two major genes involved in TAG accumulation in C. reinhardtii microalga, qRT-PCR analysis was performed. To accomplish a successful real time PCR analysis, the employed primers are considered as a critical point. Due to its great sensitivity and robust performance, we chose AlleleID 7.5 software to design the requested primers. A previously sequenced ribosomal gene (18S rRNA) from another C. reinhardtii strain was selected as the internal control gene to normalize the observed data. 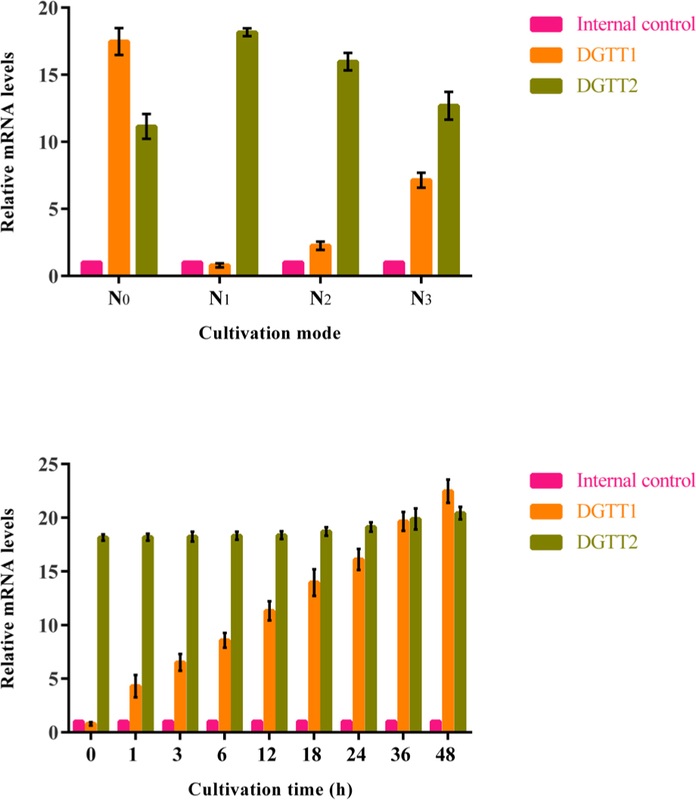 Figure 3a displays the obtained results from quantitative analysis of DGTT1 and DGTT2 expression profiles during normal and nitrogen starved conditions. The expression levels for DGTT1 transcript showed a significant increase (21.05, 7.76 and 2.45-fold increase than N1, N2 and N3, respectively) in nitrogen depleted medium (N0) in comparison with its values in nitrogen containing media. On the other hand, the DGTT2 transcript in N0 exhibited 0.61, 0.70 and 0.88-fold decrease compared with N1, N2 and N3, culture media respectively. The statistical analysis (Kruskal-Wallis analysis with Tukey’s post hoc analysis) proved the significant influence of nitrogen starvation on the relative expression of DGTT1 (p-value: 0.0189) and DGTT2 (p-value: 0.0168). Culture medium without nitrogen (0 g NaNO3) showed the highest DGTT1 expression. Besides, a gradual increase was observed in DGTT1 expression pattern from nitrogen starved to culture media with higher nitrogen concentration. In nitrogen starvation condition, DGTT1 upregulation was happened within the first three hour and was kept in its elevated amounts during cultivation up to 36h in comparison with the normal cultivation conditions with a normal decrease during 48h of study Figure 3b. There was not a significant difference (p ≤ 0.05) for DGTT2. Using qRT-PCR analysis, we showed that nitrogen starvation of a naturally isolated C. reinhardtii strain results to high expression levels of DGTT1 over observed levels from other nitrogen containing media. Remarkably, though the total produced lipid content was higher in nitrogen starved strain, but the total obtained biomass (dry cell weight) was lesser than nitrogen rich conditions. This phenomenon indicates that nitrogen deprivation might divert the cellular resources towards lipid production instead of biomass biosynthesis. Recently, omics-based approaches23 and metabolic flux analysis data24 has been stablished for C. reinhardtii. The results of the current study could be helpful in researches concerning systems biology and biotechnology of this microalga. The total content of TAGs from the obtained lipids were quantified and compared in for different cultivation modes Figure 4. The obtained data show an increasing trend towards TAG accumulation in lower nitrogen levels. In nitrogen rich, medium (N1) only 0.186 g L-1 of the total produced lipids were TAG (14%). In nitrogen, limited media (N2) and (N3) the maximum amounts of 0.175 g L-1 and 0.164 g L-1 TAGs was observed which were equal to 21% and 26% of the total obtained lipids, respectively. Microalgae are a good choice for fatty acids accumulation.27 Noticeably, the highest amount of TAG accumulation (0.299 g L-1, 0.38%) was reported in nitrogen starved medium (N0). Total triacylglycerol (TAG) concentration (the upper segment of each column) obtained from four different nitrogen levels compared with the total produced lipid (the whole column). The presented results are the calculated mean values from triplicate experiments. In despite of several advantages over other competitive resources such as microbes or plants, biodiesel production from microalgae have some shortcomings such as lower lipid production and productivities.28 In this study, we showed the applicability of using nutrient stress strategy to redirect the microalgal metabolic pathways towards non-polar lipids and mainly TAGs. Real-time reverse-transcription PCR (qRT-PCR) analysis of this strain confirmed high expression level of DGTT1 over the level observed in the control strain. The precise mechanisms involved in the overexpression of metabolic pathways for TAG biosynthesis are not clearly determined. The results of the current study could shed light on the exact metabolic and biochemical changes due to nitrogen deficiency. Besides, the results of this study could suggest potential metabolic networks for genetic or metabolic engineering and for better understanding of the C. reinhardtii systems biotechnology for biomass and lipid production. Notably, in this study a maximum level of 42.07% for lipid accumulation was shown in a robust C. reinhardtii strain which warrants further optimization and scale-up studies for large scale lipid and biomass production. The obtained results, deciphered the metabolic and biochemical response of a naturally isolated strain of C. reinhardtii to nitrogen limitation conditions. Besides the quantitative changes in DGTT1 and DGGT2 expression profiles was determined and elucidated new targets for metabolic engineering of C. reinhardtii for TAG overexpression and other valuable bioactive compounds. Furthermore, the results demonstrated the ability of C. reinhardtii to produce TAGs for green energy production and other purposes. We would like to kindly acknowledge Dr. Taylor L. Weiss and Prof. Ursula Goodenough (Department of Biology, Washington University, Saint Louis, MO 63130, US) for sharing their original TAG assay protocol used in this work. Keyword: The expression profiles of DGTT1 and DGGT2 genes change during nitrogen starvation in C. reinhardti.